Looking for a new book that brings to mind some of the best elements of Golden Age science fiction? 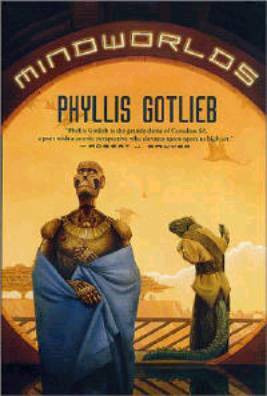 Try Mindworlds, the latest novel by Canada’s grande dame of science fiction, Phyllis Gotlieb. It can be hard for an author to pull together multiple viewpoints into one cohesive narrative. Gotlieb does so, not effortlessly but with the skill to make each different voice coherent yet distinct. The experiences of her many viewpoint characters are sometimes driven by their biology and sometimes by their cultures. Most of Gotlieb’s characters in Mindworld are humanoid to some degree in form and function, and their hopes, fears and goals are understandable in human terms. But integrity and honesty are identifiable traits even in mind-reading collective organisms and robots. This novel is more than a parade of dissimilar peoples throughout a galaxy of wonders, or a grim detective novel where a mundane crime is solved. These worlds are worlds of the mind as well as forums where armies train and physical dangers loom. It’s not necessary to have read any of Gotlieb’s earlier works, though there is some continuity with her earlier writing. Readers who remember Frank Herbert’s Whipping Star will find something of a similar tone in this novel, but the story is told from a more multicultural approach. A Golden Age story without lectures or cultural imperialism? Only from Phyllis Gotlieb.